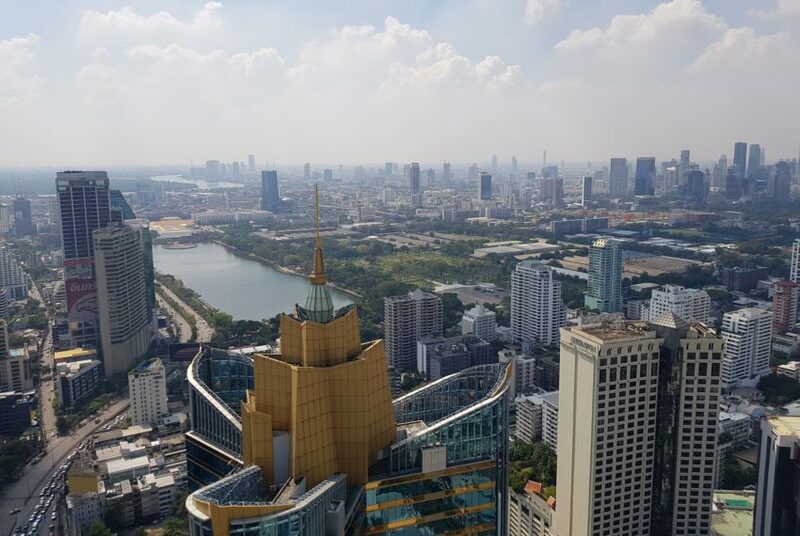 The condominium market in Bangkok in 2018 set a record for the most new project launches in 10 years, with some 65,000 units entering the market, an increase of 11% from 2017. As a result, the cumulative supply of condominiums in the capital from 2009 to 2018 has reached around 500,000 units. 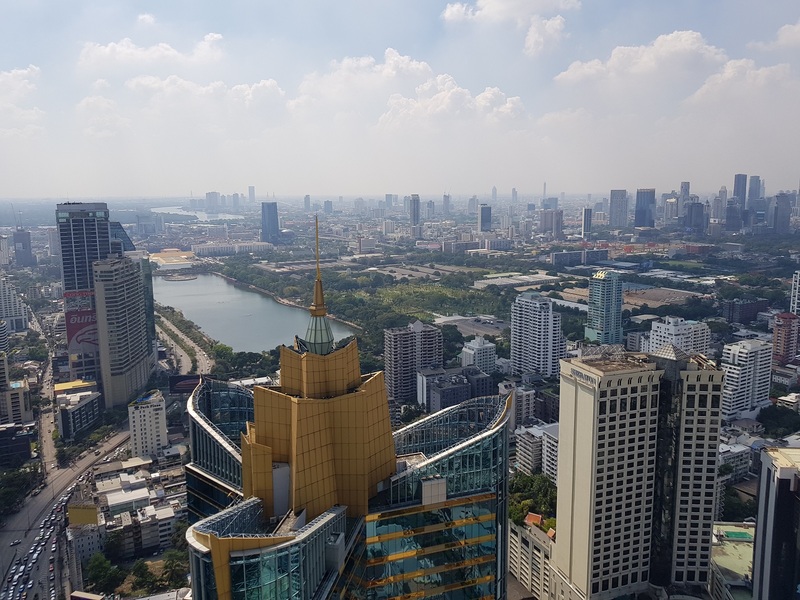 Research by Knight Frank Thailand found 42,000 units entered the market in the last half of 2018 alone: 25,000 in the third quarter and 17,000 in the fourth. The bulk of these launches took place on the outskirts of the city, especially along the extensions of the Green and Blue mass transit lines. The new supply in those areas accounted for 57% of all new units launched in the fourth quarter. The suburbs, especially along mass transit extension routes, commanded continuous interest from developers all year. The proportion of new supply in the central business district (CBD) was 18% of the total, and areas surrounding the CBD accounted for 33%. The prominent locations that developers focused on included Sukhumvit Road, from Asok to Ekamai; Phahon Yothin Road along the BTS extension (Mor Chit to Khu Khot); Rama IX to Ratchadaphisek; Lat Phrao to Ramkhamhaeng; and Charan Sanitwong to Phetkasem. 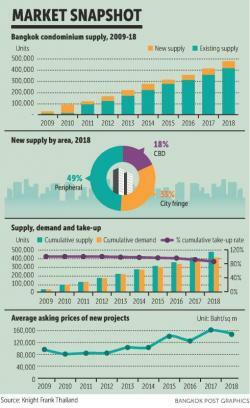 On the demand front, the average take-up rate of new projects in Bangkok throughout the year was around 55%, with condos in the CBD and surrounding zones recording take-up rates of 51% and 64%, respectively. New suburban condos enjoyed about a 50% sales rate, which is a good level considering the huge new supply that entered the market in this area. The most popular locations for buyers included Central Sukhumvit (Asok to On Nut); late Sukhumvit (Udom Suk to Bearing); Rama IX to Ratchadaphisek; Phahon Yothin (Chatuchak to Phahon Yothin Soi 52); and Thon Buri. The average selling price per square metre for all new units in 2018 stood at 150,641 baht, down by 6% from the previous year. The average in the CBD was 250,000 baht, down 8%, and in the area surrounding the CBD it was down 7% to 120,000 baht. However, the average selling price per square metre of newly launched suburban units is climbing; in 2018 it was 85,000 baht per sq m, up 3% from 2017 and 20% from 2015. The Bangkok market in 2019 is expected to slow as the overall market deals with tougher Bank of Thailand regulations on residential housing loans, rising domestic interest rates, and the state of the global economy. The latter may affect purchasing power from abroad. Knight Frank Thailand expects in the first quarter this year, average selling prices per sq m will climb from a year earlier, driven by several new developments in both the CBD and surrounding areas. In addition, in the first quarter, the transfer rate is forecast to grow compared with the same period last year. This reflects buyers’ desire to complete transfers before tighter mortgage lending rules take effect on April 1.